Faxe Beer unveiled its new gold liquid, brewed specially for bold and deserving clienteles with an extraordinary party ceremony at the Labadi Beach Hotel in Accra on September 7. The Faxe Beer 5.5 Gold is a smooth and full-bodied all-malt lager beer imported into the Ghanaian market from Denmark. It is produced by Royal Unibrew, Denmark’s second largest producer of beer in the world. The 5.5 Gold adds to the Faxe 10 per cent and Faxe Stout 7.7 per cent beers that already exist in some parts of Africa. The new beverage has also been launched in other countries such as Kenya and Burkina Faso aside Ghana, and it is expected to compete with other beer brands in the local market. Speaking at the launch ceremony in Accra, Nicholas Baroutis, who is the Royal Unibrew Commercial Director for Africa, took guests through the history of Royal Unibrew and 115 years of Faxe Beer’s evolution. 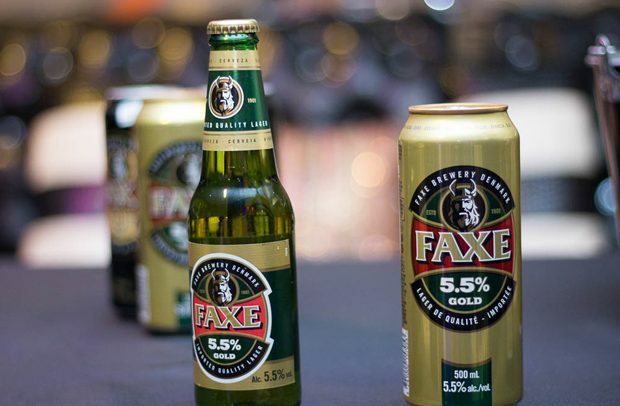 He said the international success of Faxe at 10 per cent of 300 per cent growth rate in Africa since 2012 is a bright vision for a new expansion for Faxe Gold. The launch in Accra attracted a number of showbiz personalities. Among them were actress Regina Van-Helvert, KOD, Afia Schwarzenegger and a host of others.